There is something about my psyche and makeup that works a bit differently to others (okay in some instances A LOT different) whereby if I am not interested you may as well just give up. I’m talking different, on a fundamental deeper layer, not just a surface lack of attention span, things either make sense to me or they don’t. But once you have my attention, then nothing can stop me. I’m convinced I can learn anything if I put my mind to it. I completed a Masters Degree by correspondence at 37 years of age while working full time just to prove to myself that I could do it. That was because I was interested. So very recently we finally had a shed (Steve says garage but I'm South Australian born and bred and I say shed) built at home, and after some 7 or 8 years I finally had a proper place to put motorcycles and all of their related paraphernalia. It was a very exciting time, and my interest was certainly piqued. It wasn’t until Big Steve came over for a wrenching session that I realised, well actually he pointed out, that all of my tools were absolutely crap. We’re talking ALDI special HEX keys and a socket set that my Dad gave me 20 years ago that didn’t lock anymore. It was quite the realisation, and quite embarrassing when we couldn’t even take my back wheel off of Dizzy because I didn’t have a big enough socket. With some guidance I made a list. He's good at making sensible lists. 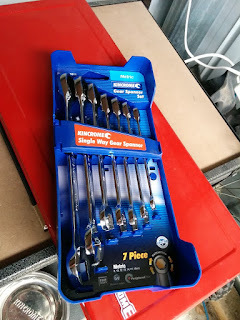 The very next opportunity I had I was down at the local Bunnings and picked out some really nice tools. I love Bunnings and I love tools so I have no idea why it took this long to buy some nice ones. 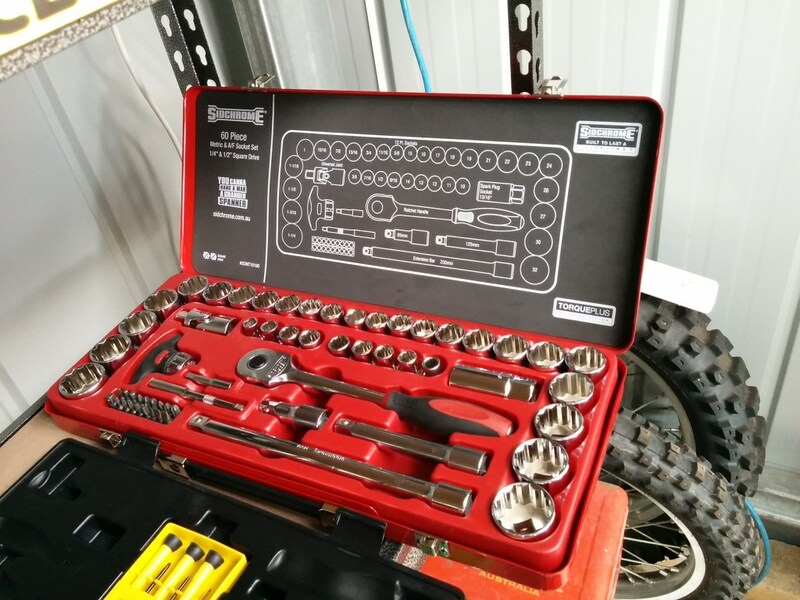 I acquired a Sidchrome complete socket set in both metric and imperial. 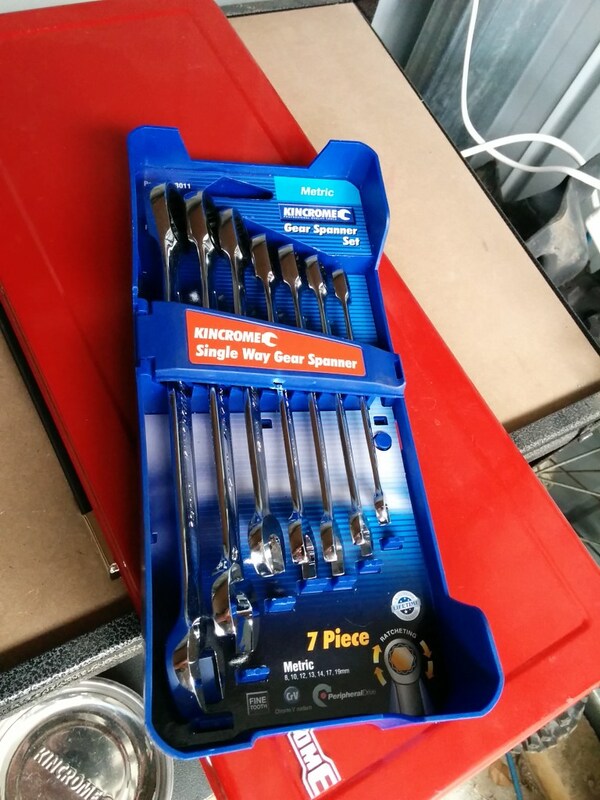 A ratcheting gear spanner set by Kinchrome. 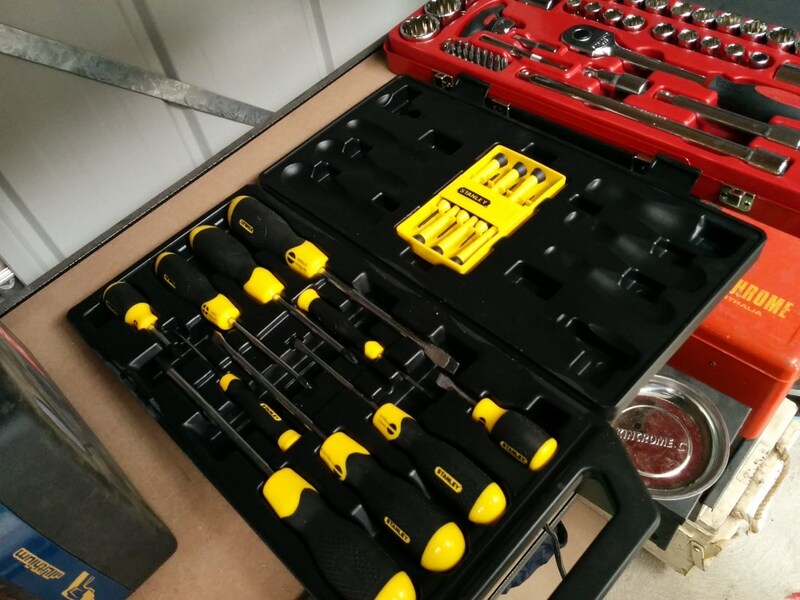 and a Stanley Screwdriver set. All up I spent over $400 AUD but I felt like it was going to be money well spent, correction, invested. This gear will last a good ten or twenty years. You can tell when you pick up the ratchet and click a socket on. I’ve been using them and enjoying being out in my shed, tunes on the box, wrenching at Dizzy for no good reason at all. I’ve done my tail tidy, changed the air filter (lol), taken the pipe on and off, removed mirrors, guards and hand grips and generally tarted it up a bit. With my new tools. I feel like a real man. A man is not complete without his shed, and a bloody good tool set. But this does not a mechanic make! I know my limits and there won’t be any drunken big bore installations like this guy articulates quite convincingly but I feel like I have enough tools, including my recently acquired Snap-on allen key set, to take on the basic maintenance of my bikes. And that's gotta be a good thing right? Sure there is loads of room for improvement, but it's a start and I'm paying real attention to how my bike is put together for the first time and I like it.